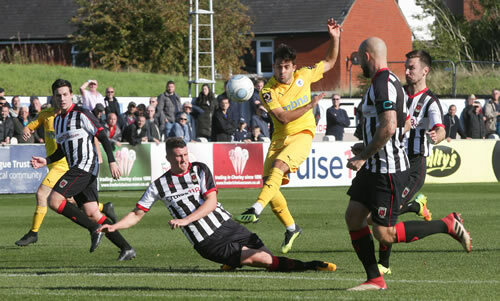 A depleted Chester side with Gary Roberts, Dominic Smalley and Anthony Dudley all ruled out, came away from league leaders Chorley with a point on Saturday following a 0-0 draw, it’s the first time the home side have dropped points at Victory Park this season. It extended the Blues’ unbeaten run to six matches, they could have almost claimed all three points but for some fine saves by Matt Unwin in the home goal late on to deny Deane Smalley. Chester will travel to play Dunston UTS in the third qualifying round of the FA Cup. The Gateshead based side were formed in 1975 and play in Division One of the Northern League and are unbeaten in their five games this season. The match is due to take place on Saturday 6 October, the winners of the tie will receive £15,000 prize money. 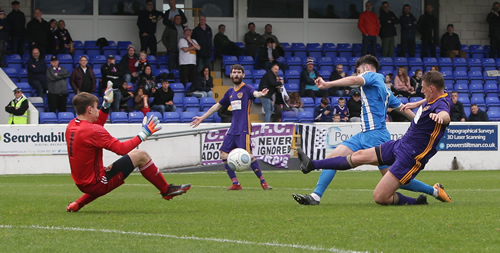 Chester overcame City of Liverpool FC 4-0 in their FA Cup second qualifying round tie on Saturday and in doing so picked up £9,000 prize money. Two goals just before half-time from John Pritchard set up the victory that was sealed in the second period by goals from Iwan Murray and Cain Noble - both players a product of the youth system. The Youth Team won 6-0 at Marine in the FA Youth Cup first round qualifying with goals from Leighton Kendrick, James Cottrell, Lloyd Marsh-Hughes, Will Goodwin and two from Stuart Crilly. The side will now face local rivals Wrexham at home in the second qualifying round with the match due to take place in the week commencing Monday, 1 October, kick-off 19.00hrs. 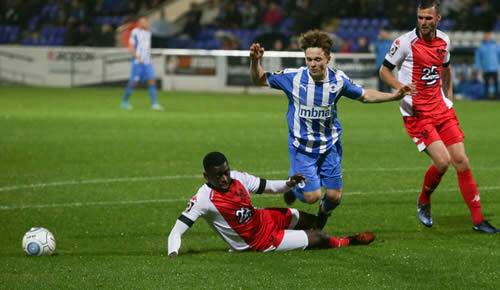 Chester followed up their victory at Boston by defeating second placed Kidderminster Harriers 3-1 at home on Tuesday night. The Blues were forced to make a late change with captain Scott Burton being injured in the pre-match warm up, as a result Iwan Murray was promoted from the bench for his full debut. It took just six minutes for the youth team player to make his mark by winning a penalty duly converted by Anthony Dudley to give the Blues the lead at the break. Matty Hughes doubled the advantage on 52 minutes before Harriers pulled a goal back from the penalty spot through Ed Williams after Danny Livesey was pulled up for handball. Chester sealed victory nine minutes from time as Hughes netted his second goal to settle any late nerves and bag the three points. Goals from Steve Howson and Dan Mooney gave Chester a great 2-0 win a sixth placed Boston United on Saturday. Both goals came in a eight minute spell early in the second half. Chester were held at home 0-0 by bottom of the table FC United of Manchester last night. As a result The Blues remain 17th in the table. Chester have been drawn at home to City of Liverpool FC in the FA Cup Second Qualifying round, the match is due to take place on Saturday 22 September. Prize money for the match is £9,000. City of Liverpool play in the North West Counties League Premier Division and have won four of their opening five games this season. They are a fan owned club that have only been in existence for three years. Chester’s long wait to stage their second home game of the season was well worth the wait as they came from behind to beat Bradford (Park Avenue) 5-3. Avenue took the lead as early as the fourth minute only for Dan Mooney to restore parity two minutes later. On 12 minutes fine work from Simon Grand wet up Anthony Dudley who header Chester into a 2-1 lead. Matty Hughes and Mooney went close before Craig Mahon scored the third just after the half hour. The visitors pulled a goal back moments before half-time as Jake Beesley, son of former Chester defender Paul, shook off a shaky Chester defence to score from close range. Eight minutes into the second half Bradford drew level with Oli Johnson bundling the ball home. Chester restored their lead on 74 minutes with a superb through ball from mahon finding Mooney who curled a shot into the bottom corner of the goal. Ten minutes from time Luke Jordan came on for his debut and the youngster won a penalty in added time that was concerted for Dudley to seal the three points. Winger Luke Jordan has joined Chester from Ramsbottom United, the 19-year-old is expected to join the squad for Saturday's home game against Bradford (Park Avenue), kick-off 15.00hrs. It will be Chester's first home game since the opening day of the season following water damage to the Deva Control Room. A looping header in added time from Jon Moran rescued a point for Chester at Guiseley. The Yorkshire side had taken the lead at Nethermoor through Scott Garner heading home from a free-kick in the 88th minute before the Blues grabbed that late vital point.